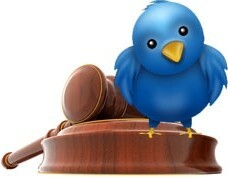 Twitter has taken a stand against those spamming their popular micro-blogging service by filing a lawsuit in a federal court in San Francisco against five of the most prolific spam tool providers, and the people that use them to flood the service with junk messages. The five named in the suit are TweetAttacks, TweetAdder, TweetBuddy, James Lucero and Garland Harris. All five are alleged to have violated the popular social networking sites rules by building and distributing tools designed to spam . According to the filed paperwork, the total cost of combating these five spammers has incurred bills of at least $700,000, with $300,000 of that figure dedicated to combat TweetBuddy spamming efforts alone. "With this suit, we're going straight to the source," the company wrote on their blog yesterday. "By shutting down tool providers, we will prevent other spammers from having these services at their disposal. Further, we hope the suit acts as a deterrent to other spammers, demonstrating the strength of our commitment to keep them off Twitter." While the announcement of this lawsuit is an important step in their increasing battle against spammers, Twitter did not detail exactly how much spam they remove on a daily basis. The microblogging site did state however they now process over 350 million tweets per day from over 140 million active users. Twitter already targets spam on multiple fronts. According to the company, their engineering team is constantly working on technical solutions in order to reduce spam. Their link shortener (t.co) enables them to proactively analyze whether a tweeted link leads to malware or other undesirable content, which Twitter says is helping them to shut down thousands of accounts abusing the service. It is thought that their recent acquisition of leading anti-malware technology firm Dasient earlier this year has been instrumental in escalating the fight against spam abuse as well as providing additional staff for their continuously expanding anti-spam engineering team.